It's tough to say what list this book belongs on, but it's the debut of a smart, funny, wholly unique voice, and it ought to be somewhere, so let's put it here. Kate Beaton is a cartoonist who draws wildly expressive portraits of historical and literary figures and then makes them say funny things. Quite often her comics reveal basic truths about who these people were or are. (Lenin: "Is the right time for revolution." Russian: "I do not wish to be communist." Lenin: "Would murderous atrocities convince you sir." Russian (rubs beard thoughtfully): "Go on ...") But the main point is that they're hilarious. Whatever else it might be, Hark! 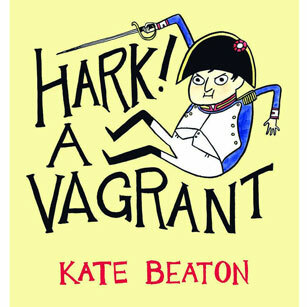 A Vagrant is the wittiest book of the year.